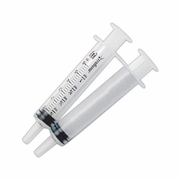 Easily and accurately measure liquid medicines in this clear oral medication syringe. This device measures up to 6 mL or 1 teaspoon with graduations of 0.2 mL and 1/4 tsp. Only for use with liquid medicines that go into the mouth. Latex free. You should use the medicine dosing device that comes with the product if you have it. Please order no more than 100 of this item.